After the evolution of computers and automation in the manufacturing industry, a new industrial revolution has arrived: ‘Industry 4.0’, often nicknamed ‘smart industry’. The Internet of Things, Cloud Computing & Cognitive Computing are the focus of attention in this new era, and smart companies aim at velocity and efficiency. Manufacturing companies are on the threshold of that new and exciting era: they integrate digital technologies into their working processes. Compared to the past, systems are taking over our thinking processes so that (technical) failures are easier to predict and information flows are digitalized. The benefits of digital innovation in the industry are tantamount, and the sector is slowly but surely understanding this: 90% of companies have on-going digital initiatives (although they are at different stages in their transformation journeys) and 62% are executing digital pilots and programs. However, only 36% are actively exploring digital initiatives. Compared to other industries, manufacturing and chemicals companies tend to be less adventurous and slower in their digital innovation processes. The reason for that is twofold: on the one hand, core manufacturing divisions and shop floor environments generally lack wireless infrastructure, because they were historically unnecessary in the age of (simple) automation. On the other, there’s a sector-wide suspicion of wireless security. Those concerns are part of a vicious circle: manufacturers are among the least protected sectors when it comes to cyber-crime. ‘Nearly half of manufacturers have been the victim of cyber-crime, and a quarter have suffered some financial loss or disruption to business as a result’, EEF reports. We believe that this should incentivize businesses to take their cyber-security to the next level, rather than letting it scare them into skepticism about digital innovation. 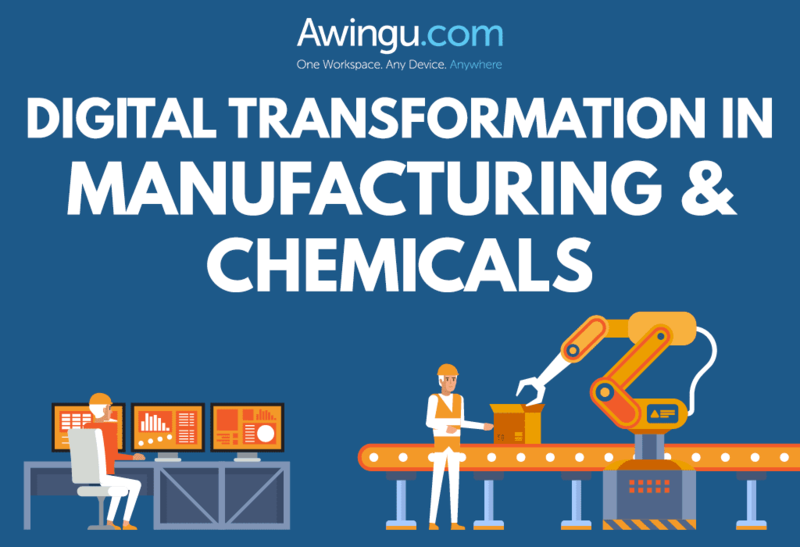 However, as businesses all over the globe are becoming more and more aware of technological evolution and its possibilities, so are the manufacturing and chemicals sector. With the global rise of mobile working, the number of mobile connections within factories is expected to almost double by 2020. And rightly so! Among the benefits of the technology investment are the improved worker productivity, better informed real-time decisions, improved employee satisfaction and litigation reduction. In order to let their bottom line fully benefit from these advantages, they must face these new challenges head-on. A big part in transformation starts with looking at existing applications, and consolidating the often niche and industry-specific software into a coherent and accessible platform without needing to replace or rewrite them. Those in search of a more digital and real-time workspace that fits in the limited budgets and in a complex legacy IT context, find the answer to these challenges in Awingu. Our unified workspace can help your company by offering a secure, cost-efficient and easy-to-use workspace that makes all your files and applications accessible via one workspace in the browser, on any device, anywhere. – Mergers and acquisitions involve a difficult business processes unification, with little uniformity between the different business units and an IT landscape that is characterized by decentralization, multiple datacenters and local EUC models. In those cases, Awingu unifies your IT environments into one easy to use workspace and without any hassle. – Easily give access to your apps & files to external parties, without the data ever leaving your environment. Contractors log in with their credentials in their browser. No need for them to install VPN clients or other software, which are often blocked by their company policies. – With granular controls you can define what actions each contractor is allowed to do with your data (such as print, copy/paste, download, share, …). – Automatically record user or application sessions in case sensitive data is handled. Do you want to know more about how Awingu can help you to achieve a more digital and real-time work environment?